Walking past it, I dreamed a moment of buying and fixing up a perfect little derelict home just 100 yards to the southwest of the PCT at roughly mile 211, a mile or so north of where the trail passes under the I-10 and pretty much at the end of the strange cluster of disparate properties that create whatever community that is there. Not that I’d want to live there year-round, but I could see turning the old derelict into an art house and sitting out hiker season there, providing showers and beds and rides to Cabazon for date shakes and Desert Hot Springs for the $6 day pass to their myriad spas and sauna. I can definitely see some form of on-site trail angel work like that fitting into my retirement scheme. For I don’t know how long, there existed such a refuge, if a little more rustic, just up the hill, called the Pink Hotel. Sadly, the property has been sold in the past few years, and, though it doesn’t look a bit changed from past descriptions (it is still a junkyard) it is closed, ostensibly forever, to thru-hikers. I direct you to this article to give you the feeling and the flavor not only of the Pink Motel but of the day’s approach to it, which was very much like my own, exactly so really. The changes of environment and temperature, of climate and weather and mood of the trail were so pronounced and radical on just that one day that it baffles me to recollect it. But such has been absolutely the norm on the Pacific Crest Trail. Extremes, extremes, extremes. The Mark Twain comment about the weather in New England certainly applies to the so-called spring here on the trail in 2010. Don’t like the weather? Wait five minutes. That morning begins with heat in a sheltered canyon and a rattlesnake sunning itself on the road for the cautious observance of Fuzzy Monkey and I. Half an hour later we’re being sandblasted, the only sound penetrating the roaring wind that of the freight train horns blowing in the I-10 corrider off in the distance, our destination. Only when we finally reach the shelter of the small tunnels beneath the rail bridge and freeway does the wind abate and the sound of cars become audible. Beneath the I-10 there is trail magic in the form of cold sodas on ice in a cooler and candy bars and a ledger to sign. I’m sure Paz listens. But I was quite surprised recently to hear his mother say she never listens to his music, not anymore. Too painful. Our granted egress through the wind farm feels a privilege given all the Don Quixote-on-crack-cocaine sabotage suffered by the poor windmills. The theft, the damaged suffered, is all for the value of the copper pirated to be resold for a fraction of its weight in methamphetamine or crack or whatever drug currently helps keeps the poor locked into cyclical poverty like so many grocery carts whose brakes lock up at the lot’s perimeter. I remember how startled I was the first time I saw a giant billboard along the I-10 picturing a windmill, a security camera and the phrase: “Copper pirates, we’re watching you!” or some such unsettling threat. The wind farm is closed today, but there is shade as promised and fresh drinking water though the wind is relentless. Seamus catches up with me at the wind farm. 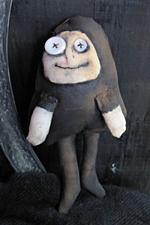 I’d met him the night before at the water source just above Winterhaven, the tiny little community tucked away in a canyon in the toes of the foot of the San Jacinto Mountain’s northern syncline. Seamus is an actor, a musician and a seasonal trip leader for an adult outdoor adventure company, among other things, a hiker not least among them. He hiked the El Camino trail across Spain and returned home to compose and release an EP titled “Moths & Butterflies.” He described the style as electronic folk-rock. I looked him up under his performer named Press On Randy on Cdbaby.com, found it, but wasn’t able to listen to any samples on the Droid, but I bet I’ll dig it. I hit our first river crossing in a canyon a few miles after the wind farm. In just a few hours since stopping to lunch by the windmills, the sky has gone slate grey. I remove my shoes and socks, ford the river, and no sooner have them back on then it begins to hail. Hail! I can practically see Palm Springs down the canyon in the distance, and I am walking in frozen rain. Fooled by the cooling effects of the river water on my feet, I walk several more miles than planned, making for my second 20-plus mile day. Walking with just one pole since breaking one and bending another on the insanely fast and reckless traverse of Fuller Ridge, I discover a strange tick. Walking along single poling it, pole in my right hand, I look down and notice my left hand hanging by my abdomen looking oddly forlorn as it no doubt struggles to understand what to do with itself. Counting the Appalachian Trail and 500 miles on the Continental Divide, my hands have hiked with poles in them for nearly 3000 miles now. It’s a very strange sensation missing a pole. I dubbed it Missing Pole Hand, and later, Bob Dole Hand. I have quickly found that this new Bluetooth keyboard with all its function keys has crippled me. My old AT method of typing while lying on my back is no longer viable. I must figure out how to deprogram the function keys, or something. Currently, I cannot type blind without fear of losing my work to an accidental keystroke. I think of Peace Pilgrim whom I read about years ago and whose little books talking about her simple act of walking for peace inspired me so in my early twenties. Took me awhile to get walking myself, and knowing what I know about people I am not sure peace will ever truly reign. But I walk with it, and with Peace Pilgrim, in mind. I am listening to Sas now in the dead heat of the day climbing, ever-climbing slowly up Mission Creek canyon toward Big Bear, a slow walk with its dozens of crossings and stony path. Sas calms me, gives me perspective: “I thought I was losing my eye, but you were losing your life, I wish I had known…” I think of Stormy, of James, of Tom, all gone now but with me as I hike, I like to think. Sas is a great musician with whom I’ve been acquainted many years through our mutual love of gluing stuff to our cars. It took years of seeing Sas at art car events for me to finally savvy what an amazing musical talent she is. I must have listened to her first album “Feel Sorrier For Me” a few hundred times by now and can’t sing her praises enough. You can find tracks from that album on iTunes and follow her newer material on myspace. The summer before last, I was utterly astounded and a little bit concerned (after the fact) to hear Sas tell of buying my book and taking it hiking with her on a section of the John Muir Trail. Whoa! Talk about the ultimate leaden chunk of pack-weight! 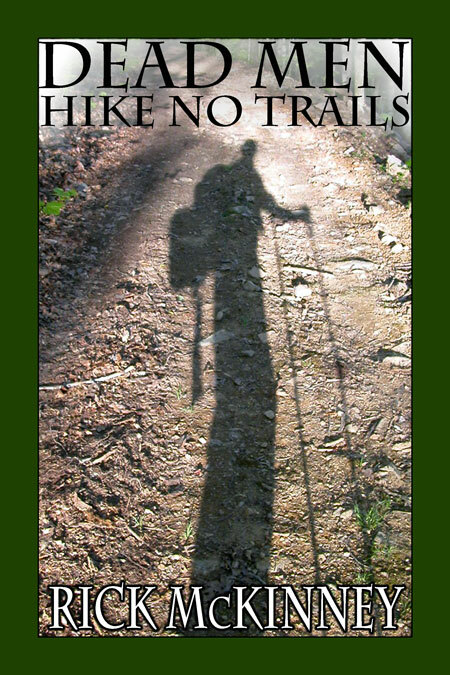 Dead Men Hike No Trails is no light book for taking out on the trail. Be good for thwacking pesky bears with, I suppose. But poor Sas! All that weight. Naturally I was very touched that she would find my book worthy of carrying into the wilderness. She sang me a song that she’d written about that very trip. The result was an utterly bewitching narrative in song with acoustic guitar. It melted my heart, and I was there with her, lost in the wilderness, lost in the music. That was two years ago. Tom Kennedy was alive and well. I have a photo of him from that day, one of my favorites, of him laughing hysterically at the naked man with the George W. Bush mask high astride the missile on the Strange McCain Missile Launcher rig we built. Good times. Low on food now, my tummy grumbling. Must make the miles! This long slow canyon crawl up the backside of Big Bear goes on forever and ever. I slow with growing elevation to 40-45 minutes per mile. This is bad. Only two dinners left with 28 miles to go, straight up. And NO WAY OUT! Where’s that S.P.O.T. when I need it?! Here’s your PCT weather forecast for today: it’ll be cold, then hot, then cold, then hot, then windy as hell, followed by and/or mixed up with rain, hail, then it’ll be hot again, oh and then you’ll be tromping through snow up to your nuts while dying of thirst. I don’t recall ever having had any fear of snow. I grew up in the east as a kid. Survived and thrived in the great Storm of ’78 north of Boston. But after Fuller Ridge, I’m feeling a little nervous about snow all of a sudden. I hope that goes away by the Sierra. A streak of paranoia hits me midday on Tuesday in the canyon. Very weird. No fear of bears, though. I have no more food! When I think of quitting, I think of Donald Crowhurst, the single-handed sailor whose attempt to circumnavigate the globe in the British Sunday Times race ended in insanity and death. It ended that way because it began and was launched under such terrible pressure. The man couldn’t have quit to save his life, as it were. So he didn’t. I ponder that kind of pressure out here. Of disappointing people. It’s so hard out here alone. I listen to Terrence McKenna lectures that somehow made it into my odd iPod mix (thank god), listen to him speak of all of us as little bits of eternity sticking into the fabric of space-time and for some reason occupying a monkey body for awhile. I love it. Great stuff, weird as it can get and therefore somehow just perfect and poetic. In my monkey body, laboring along the trail in constant wind, the occasional face-full of dirt, I turn and like a chimp blow a raspberry at the fading image of San Jacinto, not at beautiful San Jacinto per se, but at all the trail now behind me. Just outside Big Bear, I contemplate an early hitch into town from a less convenient road point, low as I am on food (I’m out). It is dusk. I’ll never get a ride or free to death trying. I turn ahead and face the final 12 miles or so on faith. Not a hundred yards away on the trail, I encounter a little oasis of trail magic. I open a cooler and am staring at a fully stocked larder of cookies and fruit. I am saved. There is a love seat by the trail and an empty window frame hanging from the trees through which to watch the sunset, all the work of Grayson, owner of the Big Bear Hostel. There are many lodging choices in town, but Grayson has just won my heart. I sit in the frigid near-night air a moment, laugh at the randomness of a couch and stocked larder in the forest and watch my breath swirl off into the past. I stand, steel myself to the cold and walk into the future.